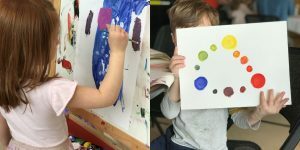 For the first sessions, children will receive an opportunity to create abstract art and produce their own version of “La Ronde” - a series of circles in color inspired by Siri Berg’s exhibit. In later sessions, children will get to make small popsicle stick homes, in honor of Folkhem’s sustainable wooden home design in Sweden. This craft draws inspiration from part of the “Urban Challenges” exhibit. The remaining art workshops will encourage innovation and incentivize children’s curiosity through basic STEAM art activities. March 16, March 30, April 13, April 27, May 4, May 18 and June 1 between 12-3 pm. Also, check out our new Children in the City - Little Library & Funky Town. Storytime every Saturday at 3 pm. Experience Swedish children's literature (in english) in the Little Library.